31 Days of Perfect Party Planning- Day 1: What is A Perfect Party? I love party planning-the decorating, the crafting, the arranging, choosing the colors and theme, researching ideas, even making the food if I need to! My love for parties was "born" when I helped decorate for a baby shower. 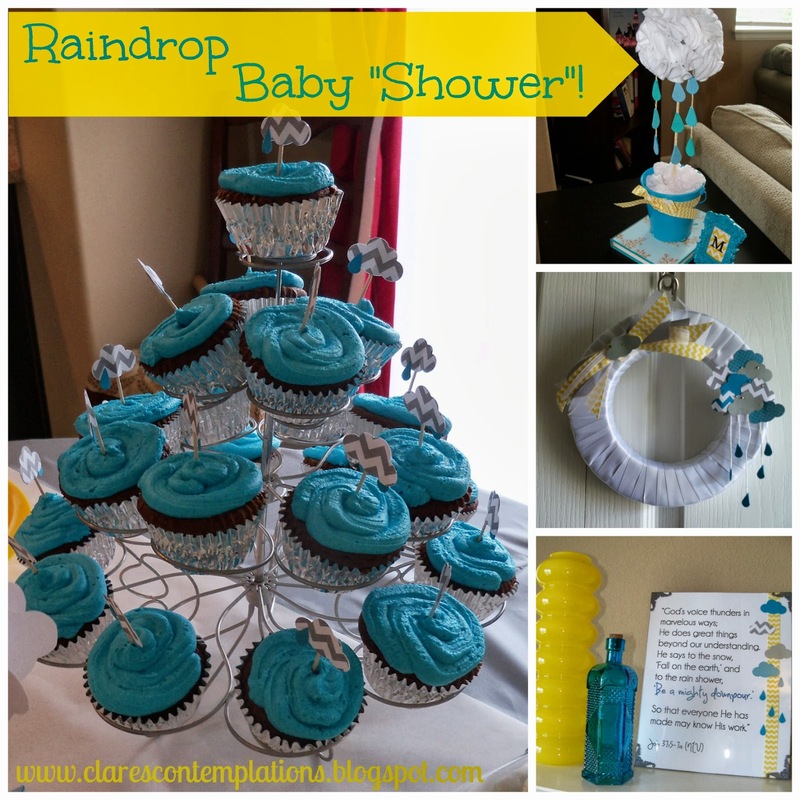 Pinterest wasn't even really a thing yet, but blogging had really started to boom and I had seen the cutest idea for a "tiny" birthday party that I knew would translate into an adorable shower. I didn't even know you could throw a party where you didn't buy everything that matched from a store! After googling how to make tissue paper pom-poms and staying up late tying ribbons around flatware, I was hooked. And then I realized that I could blog about my parties. I'm not the best photographer (it probably doesn't help that I am using a $100 point and shoot, but hey, use what you've got!) but people seemed to like them. And the more I did it, the better I got! And now, I have people asking me to decorate for, and give advice on, parties and planning quite a bit. So, I figured it was the perfect subject for my first foray into 31 Days! The first thing you might be asking is: why "perfect" party planning? First, it's what my party Pinterest board is named (although I have a separate one for baby showers named "Bump Bashes"), and clearly, I have a thing for alliteration, after all my blog *is* named "Clare's Contemplations"! But really, its because it doesn't mean "exactly what I saw online" or "looks like it was done by a professional" or even "I got everything done on time and wasn't crazy". To me, perfect means: it makes me happy, I felt accomplished, there was a serious investment and I got a good return, and most of all, that it represents me! And that's the most important thing to keep in mind when planning a party-do what makes *you* smile! Don't do the expected, or the demanded, or what feels forced. The essence of a party is celebration! Not drudgery or overblown expectations. If you *want* to make 150 mice out of cheese for your party-do it! But if you feel like you don't even want to have anything but cake, guess what? That is just as valid of a choice. In this series, I will walk you through how I plan and execute a party, but if you do it differently, that's fine! Maybe you will get a new idea or tip that will bump it up another notch. And if you have never planned a "perfect" party, well then, you are in the right place! Day 1: "What is A Perfect Party?" Day 6: "For the Love"
Day 7: "Using the Google"
Day 8: "Keep It Tight"
Day 9: "Let It Go"
Day 11: "Let's Talk Money"
Day 12: "Some of My Must-Haves"
Day 13: "Re-Writing the Calendar"
Day 14: "Party Planning Pals"
Day 16: "Invites (Or Not)"
Day 17: "For My Friends"
Day 22: "Pretty Pennant Banners"
Day 24: "Some More of My Must Haves"
Day 25: "Just A Reminder"
Day 26: "All Fun and Games"
Day 27: "Savvy Shower Tips"
Day 28: "How to Be a Better Guest"
Day 29: "After the Party is Over"
Day 30: "First Birthday Party: Sweet Tea and Sunflowers"
Day 31: "What's Your Gift?" The Nester's "2013 31 Days"
Thrifty Thursdays at "Living Well, Spending Less"
I am NOT a movie-watcher. A book reader, a music listener, and a TV show lover, yes, but movies, not so much. I am, by nature, a pretty deep thinker. I don't say that as a positive or negative, just a statement of fact. I think that's why I prefer TV. Over the course of a season, a show can develop a storyline. In about an hour and a half, a movie (unless it has sequels) has to do the same thing. And it usually isn't done well enough to make me happy. But, I am married to a movie-watcher. Of all genres, types and themes. So, to make him happy, I occasionally allow myself to be coerced into watching a Redbox. Last night, he wanted to rent one. We searched for one that we could agree on, I insisted on a comedy. Umm, I won't reveal what we rented, mostly because I don't want anyone to think that I am endorsing it, but it was *not* a comedy! And not only that, but it reminded me why I don't watch movies. It had a relatively straightforward story: Guy is married. His wife cheats on him. He finds another girl (while still married), and starts a friendship. This girl, of course, really "gets" him. She is everything his wife is not: appreciative of his humor, honest, values him for himself, witty, pretty, keen, etc. Naturally, as the movie progresses, the intent is that you would root for this friendship to develop into a romantic relationship. You are "rewarded" when the guy sees how much this girl values him, and leaves his wife, who does not appropriately value him, and they live happily ever after, right? But see, this is the problem. I am not satisfied by this scenario. My initial response was to root for the guy/female friend. Superficially, I like the chemistry, I want the guy to get the girl. Or vice versa. Or whatever. I like a happy ending. And in this film, the answer seems to be that the main character finds this great girl and they go off to "happily every after". But this contradicts what I believe. In that couples, who have covenanted in marriage, should strive to stay together no matter the obstacles. That infidelity can be overcome. That no matter how your spouse treated you, to develop romantic relationships with other people while married is also infidelity, even if not as blatant. And my mind chews on the problem without ceasing. And to think that Joel finds movie watching relaxing! How can I watch a movie that goes against what I claim to be right and true, without sacrificing some of my values, whether intentionally or unintentionally? How can I root for this guy to throw away his marriage, just because something "better" comes along? Don't we see in real life all the time that this doesn't work anyway? You think that you deserve more, that this person, the one you are married to, doesn't understand you/love you/value you/treat you the way you ought to be treated. So you go looking for something better. But then the cycle is repeated all over once the novelty wears off. I know that this is not right. But I try to convince myself, it's just fiction. It's just for enjoyment, just a meaningless distraction. But is it? 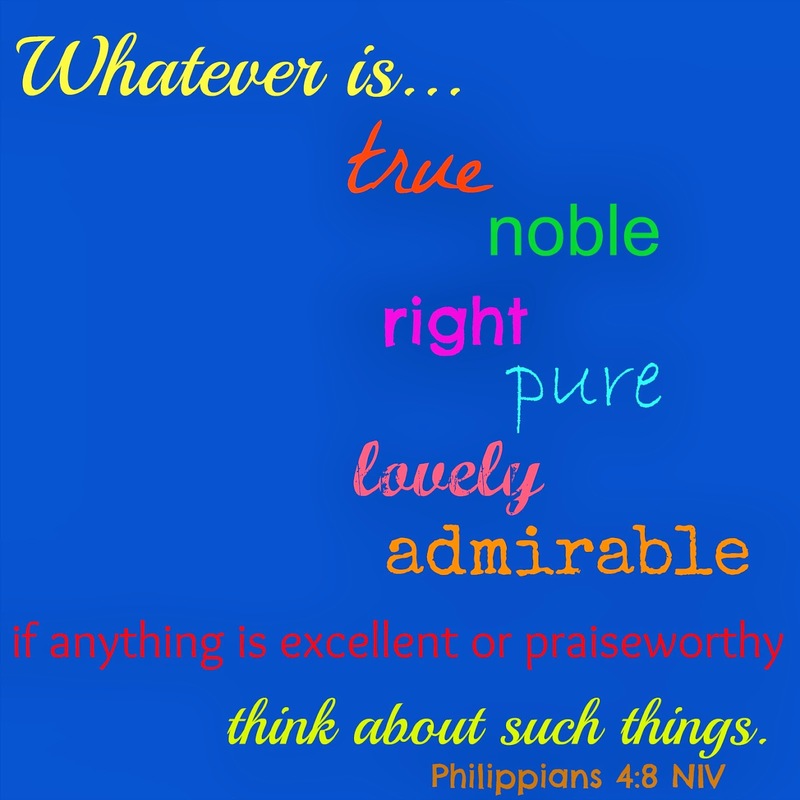 Does it really focus my thinking on things that are beneficial? For me, the answer is "no". I'm not better-just different. I mull movies over and over in my mind ("The Green Mile" kept me awake for two nights straight-again, not recommending this particular film, just stating my experience, because I was so disturbed by the lack of true justice!) and in this case, my first thought was, "Well, I'm glad they got together in the end." But is it right to feel that way? Did he do the noble thing? Were they behaving in a pure manner? Are those admirable actions? I think we can agree, the answer is , "no". 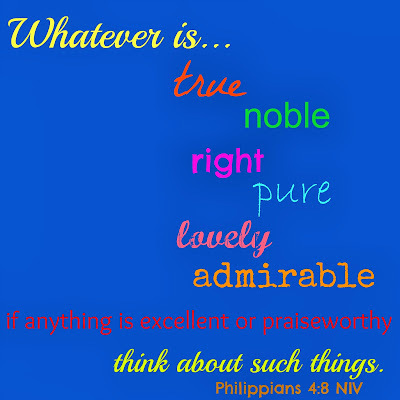 So, I think that this movie gets a big fat "F" in the Philippians 4:8 department, because I was thinking on it, and it wasn't any of those things. Whose side am I on? The side of the wronged guy, the side of the unfaithful wife, the side of the sensitive girl "friend"? It makes me a little worried that instead of being sad that the guy left his wife, I am happy because he found "true" love. I know it's just a movie, but I still have to pick a side.Well, I hope you would say I am on the side of truth, the side of righteousness. God's side. But in this case am I? I think we have a tendency to separate things out, to justify why we feel a certain way, but I am starting to realize that has to stop. I can't say that I am just watching mindlessly, because I'm not. I am "thinking about such things." And it will slowly, subtly, erode my judgement if I'm not careful. One day, I'm on the side of the fictional downtrodden guy in the movie, and I don't think it is too far of a stretch to extend it to a real life betrayed friend. I want to stay on the right side, and to do that, I think I'm going to have to be a lot more critical of what I watch-because it is too easy to find myself on the wrong side. I have to stop thinking that these things haven't taken a side. They most certainly have. So, it's time for me to take a side, too. It has been a while since I posted a baby shower, the last one was the "Purple Butterfly Shower" back in May. I did a bachelorette party and a wedding in July, but since then it has been pretty quiet on the party front. It was nice to get back into the swing of things with a super cute "sprinkle" (another name for a smaller shower for second or later child). My sweet friend, Denise, was the guest of honor-she just had her fourth! It was an honor to get to plan another shower for her-especially since she is really the one who ignited all the party planning/decorating craziness! Sarah and I did our first "real" shower together for her: the "tiny" baby shower! Honestly, even though that was three years ago, I still love that theme. We considered this a "sprinkle" instead of a real "shower" because we didn't plan any games and it was really last minute-we pulled it off in about a week. I really believe sometimes that Sarah and I have connected minds, though, because it came together seamlessly. We decided that we would play on the rain/shower pun, and our theme was born. Sarah chose the turquoise and yellow color scheme, and I deemed that gray was a necessity. It was a great way to welcome a sweet, new baby boy! I did these mason jar drinks for the "Hungry Caterpillar" Shower but since that was in a different state, I decided I could get away with it again. The cupcake liners were from Target, and I purchased the chevron straws at Hobby Lobby. The yellow bucket is Walmart, the turquoise one from Target. I purchased a cloud shaped punch from Amazon (my big splurge for this shower) and simply used an X-acto knife to put a slit in each punch and slid it over the straw. I used yellow washi tape (Target) to attach the straws. Note to self: attach the straws *before* putting in the cold liquid next time! It stuck okay, but it would have adhered better on the glass before it was cold. I filled them with lemonade, and stacked them on ice in the bucket. The favors were lemon "drops" and I used Avery labels printed with "Thanks for "dropping" by Denise's "shower"! I used scrapbook paper (Hobby Lobby) and stapled it over cellophane candy bags (also HL) and added a cloud punch with a glue dot. I loved the dotted paper with the chevron contrast! Sarah crafted this adorable topiary. She used felt circles pushed into a styrofoam ball. Then she attached felt "raindrops" on string. We found out through Pinterest that it is easy to make a raindrop by folding a heart shape in half. So that everyone He has made may know His work." I really felt it was so fitting-and especially to just pray that this new little life will be a "mighty downpour" in the name of the Lord. I had so much fun putting it together, too! I positioned all my text to the left to leave plenty of embellishing room on the right for ribbon, clouds and raindrops. I found my fun fonts on Dafont (I used "Champagne & Limousines" and "Joy Like Sunshine Through My Window"-love all the fun, free fonts, and they are so easy to download.) and typed it up in Word. I slipped it into a spray painted frame from the Dollar Tree. The guest of honor took it home as part of my gift! I couldn't resist buying some mums at Walmart (only $1 each!) to add some live flowers. I put them in a Longaberger Oval Spring basket and finished it with some ribbon (HL, Dollar Tree and Walmart). Another one of my favorite touches: I hand stitched the two cloud pillows. It was my first time trying a blanket stitch and I am in love! I actually really like hand stitching-I find it to be relaxing! I put together a little tutorial on the clouds that I will try to get up soon. Sarah did the open frame with the clouds and raindrops-felt shapes on baker's twine, it was so cute! She also put the monogram in the frame-it is a scrapbook sticker letter on scrapbook paper in a Michael's frame (a *steal* for $0.50!). It is easy but such a cute personal touch! We finished the mantel decorations (my friend Christy, who also hosted the "Vintage Pink" shower, has such a lovely fireplace!) with a pennant banner (handmade by Sarah). She also added the yellow watering can-a nice touch opposite the flowers and a great pop of color! I hung balloon "clouds" from the ceiling interspersed with giant heart "raindrops" over the guest of honor's seat. Another note to self: remember to put marbles in the balloons the next time you are hanging them from the ceiling! I wrapped my gift in white paper from the Dollar Tree and added scrapbook paper embellishments. The giant cloud at the top ended up looking a little like a car, but oh well. I love wrapping my gifts to coordinate. It is like a decoration that the honoree gets to open! I made a little wreath for the front door- I wrapped a styrofoam wreath form in ribbon and added the clouds. I loved the dangling raindrops! The "bow: is just knotted ribbon-so quick! I also made the cloud chandelier (or mobile if you prefer). It was probably my favorite thing next to the Scripture. It is a little hard to see in the photo, but it was a great focal point over the food! I used this fantastic tutorial and templates from HGTV. I usually hate video tutorials, but this one is short and easy to follow. I added the raindrops (more heart punches, although I cut these in half to make them hang straighter and sandwiched the fishing line in between) for a little color. I joked with Joel that I probably use more of his fishing line than he does! Christy made the cupcakes again-she is the baker/caterer to our decorating skills! (See more of her work here and here and here!) I used my tried and true technique of sandwiching a toothpick between two paper punches. It is a little hard to see, but I added a tiny raindrop to each cloud! I also made a "runner" of of white wrapping paper, that I tried to cut to look like clouds on the end. It is a little hard to appreciate in the photo, but the thought was good. So, I don't know about you, but when my plate is full to overflowing and I have too much to do, I decide to take a vacation! Since I have been posting more regularly, I didn't want you to worry about my M.I.A. status from earlier this week. Joel has some changes coming up at work, and this was his last four day "weekend" for a while, so we decided, *completely* spur-of-the-moment, to take a trip south to Mesa Verde National Park and visit some family in New Mexico! We planned the entire trip in about an hour, and were packed and ready to go in about three (including doing all the dishes from having company over on Sunday night!). It was a great experience, the kids loved it, and I am so glad that we decided to "seize the day". We left Monday and came home Wednesday, and cell reception was horrible so I was mainly off the grid! Like what you see? 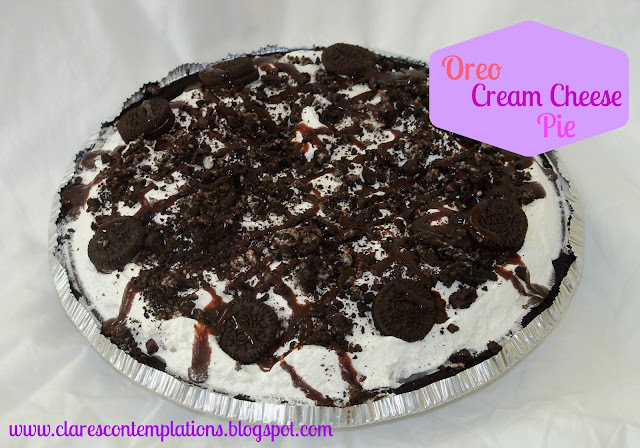 "Like" Clare's Contemplations on Facebook! 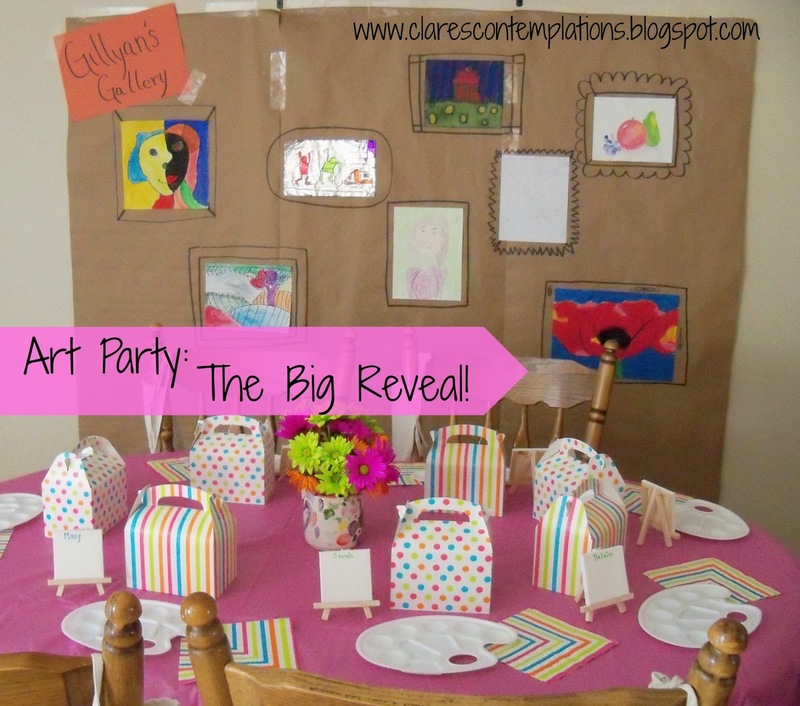 We've covered some of the snacks, and the favors, but there is still lots of "Art Party" to see! The choice for the theme was a no-brainer: my niece not only loves to appreciate art, she is quite the little artist. Her art was the inspiration for the party and also served as the bulk of the decorations! I set up a backdrop for the "gallery" by using brown kraft paper behind the table. I taped three pieces together on the wall, and then placed different works by my niece on them and free-handed "frames" with a black Sharpie. It was a great way to show off all the pieces that she is so proud of! She is so prolific I also had enough pieces for another "installation"! I ran a line of string and used clothespins to display more. She has taken several courses of art classes-and it paid off! I also put up a few actual canvases that she painted. I wrote up a little "critique" for her party as a joke. I had set up the wall and titled it "Gillyan's Gallery" and so I figured any major opening deserved a little press! We set up the food nearby, and used some more art to anchor it. We found paper fans that coordinated with the party colors and hung them above. For the food we kept it simple, it was an afternoon party, so we didn't need anything too extensive. We did fruit and dip, and pretzel rod "paint stirrers", cheese sticks "crayons"-they came in packaging that had crayons on it! I served the Rice Krispy "paint brushes", and mini cupcakes as sweets. We offered them bottled water (I wrapped it with scrapbook paper) and mini orange sodas. The girls each had painter's palettes to use as plates. They were $1 each at Micheal's and so perfect! Josie had no problem loading her's up! Each girl's place setting consisted of her favor box, the painter's palette plate, and a tiny canvas on a stand. That was the first activity-they used Sharpies to "paint" their canvasses. We set up a long table and covered it with kraft paper for the other activity. 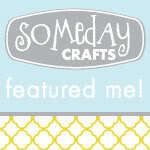 We hung up this cute pre-made banner (I think this it the only banner I've ever decorated with that I haven't made!) and some whirly streamers that we got from Target. The girls decorated their canvasses, and also the aprons that were part of their favors. We picked up the canvas aprons at Micheal's and it was so great that they were dual-purpose: activity and favor! Wearing their freshly decorated aprons, each girl painted a little ceramic figurine. They were incredibly detailed and it was another great take-home project. The last activity was a clay-modeling game. The girls created different things with their dough-they had a great time. This is Josie's pizza-I think! 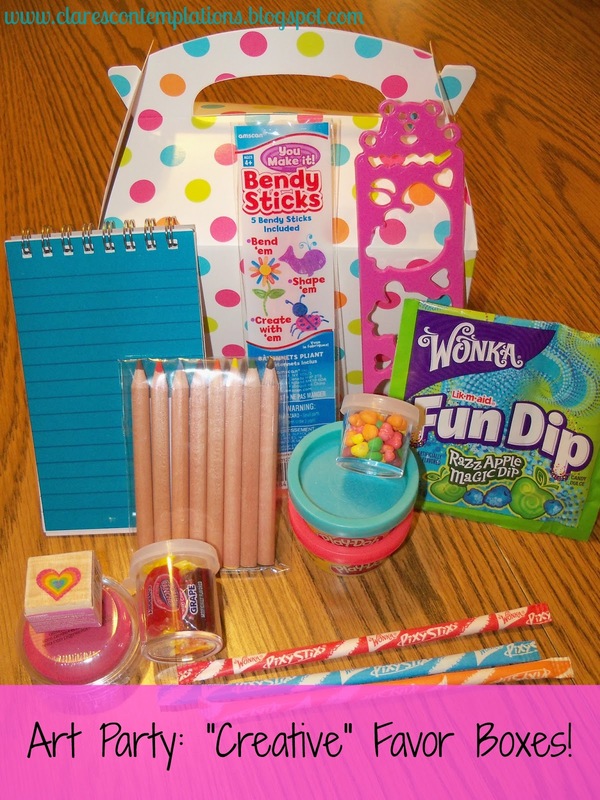 The girls all had a wonderful time creating and crafting and everyone went home with lots of personalized goodies! Everyone loved all of Gillyan's art, and I think she was very pleased with all the recognition and compliments. It was the perfect party for a budding artist! Want the rest of the "Art Party" details? Follow "Clare's Contemplations" on Facebook-'cause we're friends, aren't we? I had a dream once. Not the sleeping kind, the "imagine what you really want" kind. It was about my house. Mostly, that it was always clean. Now, if you know me at all, you know I really do try to keep my house clean. Not just picked up, but actually wiped down, dusted, corners swept, clean. The operative word here is "try". I am enamored of the cleaning style where you pretend your house is for sale (that will never be the case for me in this house, since we rent) and so you always keep it clean, surfaces clear of clutter, in case you have someone come by for a showing. I have read enough articles about selling your house to know that limiting your personal items and keeping flat areas bare helps to promote a feeling of calm and peace that buyers are drawn to. 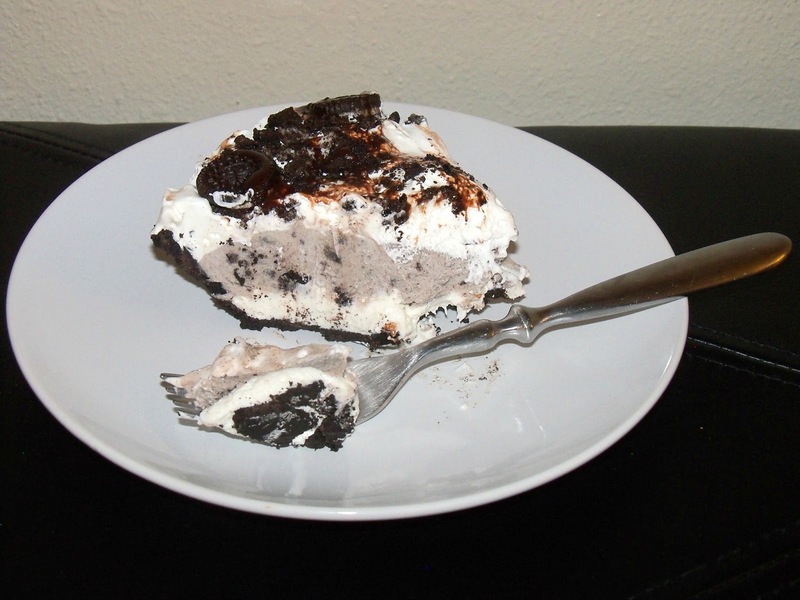 And to that end, I kept taking everything off my refrigerator. I thought I was supposed to enjoy looking at it's blank white door, that keeping it clutter-free would make me feel more orderly. I kept a few photos on it, but nothing to amount to much, and the bottom half for a long time had nothing on it besides the magnetic map puzzle of the U.S. (on of my sad attempts to try to help my kids to have a better grasp on geography than I do!). But things kept creeping on there. I would receive a "precious" art piece from on of my kids and I would think, "I'll just stick this on the fridge until I can throw it away without them knowing." Or, they would slap a magnet on a freshly crayoned picture, for when "Daddy gets home". They were always bringing stuff home with magnets already applied-photo frames, charts, Scripture verses. And I would just keep telling myself that I needed to take it off, because that was how it was supposed to be, right? And then I realized something. My kids are 5 and 7. I don't know if we will have any more-that is definitely a subject for a different post. But they just keep getting older, and every single prophecy that "the time will just fly" is coming true at an alarming rate. I really do treasure my kids. I take time to really *be* with them. And so I don't really care if my refrigerator door isn't pristine and uncovered. It won't be long before there aren't any more crayon drawings and things pressed between contact paper. I will be the only one choosing the colorful magnets and I can curate the art to my heart's content. But for now, I am really enjoying all the little things that remind me that I have two healthy, sweet, *creative* children to fill up my refrigerator door. I know that if the Lord allows it, I will see my kids grow up to be wonderful adults, but right now I am treasuring this part. I don't parent perfectly. However, every now and then, I have a moment of clarity, when I realize that while I don't suppose I will ever remember stepping on Legos fondly, that I have the opportunity to create so many more good memories than bad ones. And when I think back on all the times with my kids, I want it to be about them, full of who they are, so that neither my memory nor my fridge door are bare and boring. 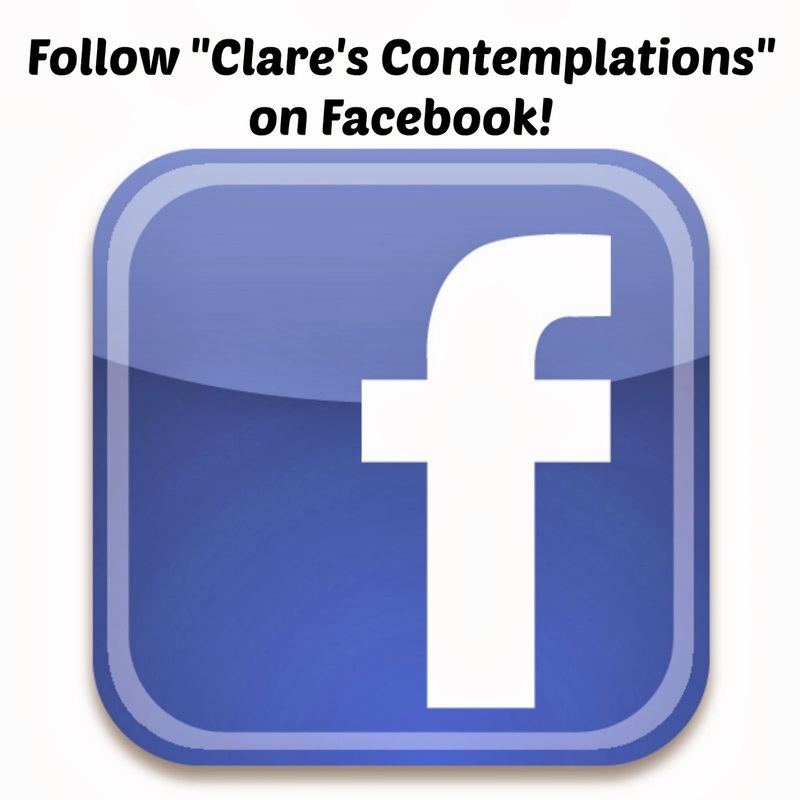 Follow "Clare's Contemplations on Facebook"! Pretty please? Ever since I was little I have *loved* party favors. Probably for a couple of reasons: they include candy, they are a reminder of a fun time, and the usually including "mini" items! I love anything tiny. :) I usually try to stick pretty close to the theme when I do party favors, without being boring. The favors for my niece's "Art Party" were definitely not! We really wanted things that inspired creativity and fun-and were also colorful, just like the party. My sister and I decided to put in lots of fun things. -Bendy sticks- these are wax covered, bendable sticks that have a light tackiness so they will hold to surfaces, they are really fun! I believe we bought the mini Play-Dohs from Walmart or Target-they are usually in the party section.